When it comes to serving our customers, we work to serve you in a different way than you would expect. We believe being different is better. Here’s why. We believe connected communities become thriving communities. This statement is the heart and soul of our company. This belief is manifested through each interaction with our employees. As a customer, you can expect a different experience because we, as employees, practice living out these standards. Every. Single. Day. Their time is more important than ours. So, what does it mean when we say, their time is more important than ours? For us, it means showing up on time for appointments. Not in a four or eight-hour window, but if you schedule an appointment with us at 9:00, we will be there. This is one way we are different from other service providers. Own the answer. You may ask, how does Alpine own the answer? One way we live out this standard is through developing solutions to complex technology needs. For example, a large local employer needed broadband connectivity throughout its campus, and they needed high-speed data where none existed. We rose to the challenge and constructed a fiber-optic network to their property in rural Clayton County. They are now receiving 1 Gigabit of internet speed and are prepared for future growth. Invest in our future. Expanding Alpine’s 100% fiber-optic Fusion Network throughout our service area is an example of how we invest in our future. But it goes beyond constructing the most state-of-the-art communications network in the area. We believe that when we stay local, shop local, employ local, and sponsor local our future is brighter and more secure. Our mantra is when you choose Alpine, we all thrive. Connect the way you want to. Today, choices for communicating extend far beyond voice and data. You have the choice to connect wired or wirelessly, in person or virtually, near and far, scheduled or on-demand, on a device or in person. Our mission is to help you connect the way you want to. When you need someone you can trust to keep you connected, we make those connections possible. Be tenacious about getting it right. The adage, “try and try again” resonates with our team. We are tenacious about getting it right. We conduct weekly training sessions for all employees to keep pace with ever-changing technology. Customers receive surveys and follow-up calls after repairs and service installation so we know that the job was done right. If not, we make it right for the customer, no matter the time of day or day of the week. Alpine’s beliefs are experienced by our customers and our community through these standards. We rely on you, our customers, to let us know when we are hitting the mark. Tell us about your experience, share your story with us by completing a survey or review us on Facebook and Google. When you communicate your honest feedback, we grow and improve. If you are not an Alpine customer, we invite you to experience uncommonly reliable services backed by a local team who cares for you. 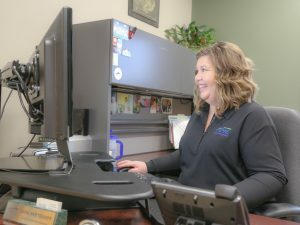 Connect with us on the phone at (563) 245-4000, online at www.alpinecom.net, or on Facebook, LinkedIn, and Twitter. ← How Connected Are You?